We can’t rave about these brownies enough. They are simply delicious and just what you need after a long day on the slopes along with a piping hot cup of tea. It is probably the simplest cake recipe we use at The Tasty Ski Company but it is also quite possibly the most delicious. 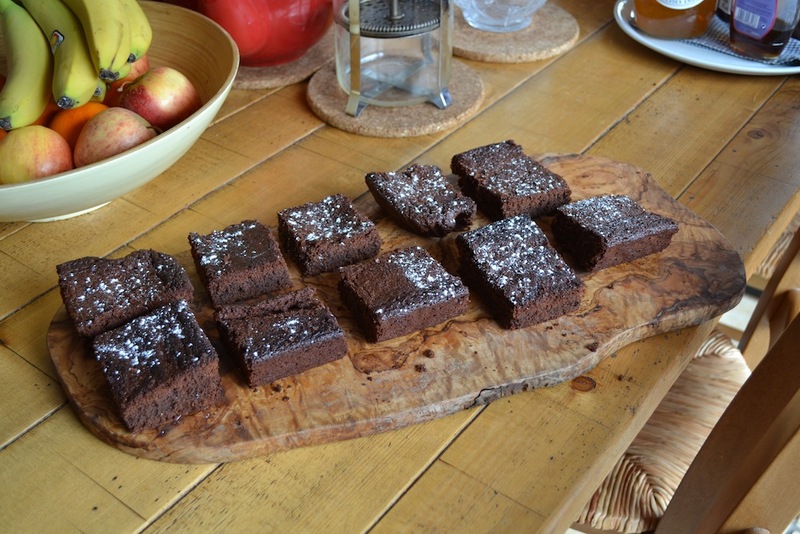 The most important part of the recipe is getting the cooking time right – the brownies should still be slightly gooey on the inside but cooked enough to hold their shape when cut into squares. Whisk the eggs and sugar together until the sugar has dissolved. Meanwhile melt the butter and chocolate in a bain marie (a pyrex bowl over a pan of simmering water). Fold the flour into the sugar mixture. Fold the chocolate into the mix until you have a homogenous mixture. Add the mixture to a greased baking tray and place in the oven for about 20 minutes. The mixture should look set but still have a bit of a wobble when you shake the tray.